If you had told me that I would become hooked on a public television series about midwives in the ’50s and ’60s, I would have told you that you were off your rocker—but as it stands, I have recently become very addicted to Call the Midwife. The PBS series is based on the memoirs of Jennifer Worth and tells the stories of the nurses, midwives and nuns of Nonnatus House, who live and serve poor women in East London’s Poplar neighborhood. The show began airing on PBS in 2012, and it got my attention this year at the beginning of its seventh season, when it featured its first-ever black midwife, a Jamaican woman named Lucille Anderson. 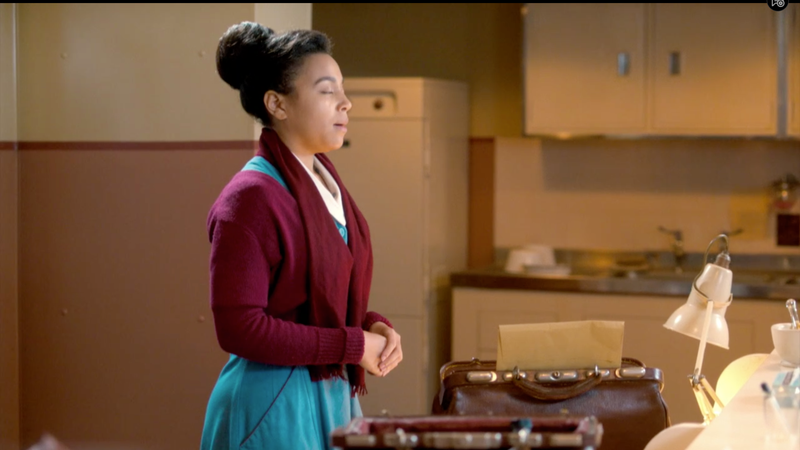 Lucille’s character represents the story and struggles of a wave of Caribbean nurses who moved to the U.K. in the 1960s to support the expanding National Health Service. Many of them experienced hostility and discrimination, and Lucille’s story is no different. In season 7, we see her work to fit in not only with her fellow nurses at Nonnatus House but also with other black people in London—both socially and religiously. Nonnatus House is her first job after her nursing training, and as time goes on, we see her fall in love with the work she is doing and the vocation she has chosen. There are, of course, bumps along the way—but all of it serves to make her story more realistic and her character more likable in my eyes. Because I am not the kind of person who can just start a series in the middle, I went back and watched the previous seasons of Call the Midwife so that I would have background on the various people Lucille encounters while living at Nonnatus House. It is a very binge-worthy show. Lucille’s story got me hooked and put me in my feelings, especially the penultimate episode of the season. I highly recommend it to everyone. The final episode of season 7 will air this coming Sunday, May 6. If you want to catch up on what you have missed, you can visit the Call the Midwife website. Call the Midwife is made by Neal Street Productions for BBC One and PBS and has been one of Britain’s most popular drama series since it launched in 2012. Vanessa Redgrave voices the mature Jennifer Worth. Check out Call the Midwife on Sunday at 8 p.m. ET, and see the episodes you’ve missed on the PBS website.